I don’t have any children (yet), but when my friend became pregnant with my goddaughter I asked if she would mind bringing her around my dogs so that I could get them used to children. 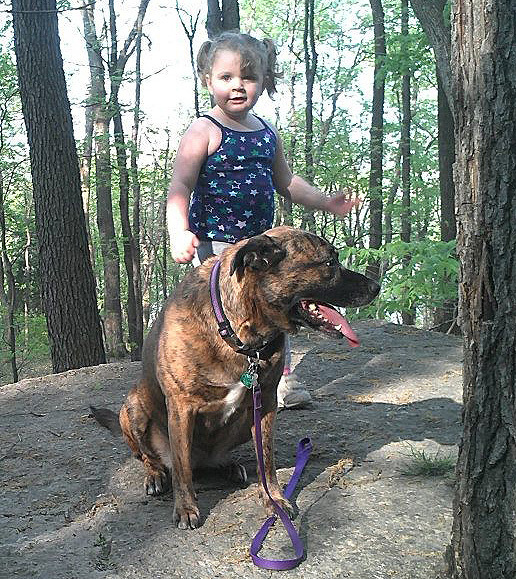 Harley Quinn (my pit bull) fell in love with my goddaughter. When she would cry, Harley would be there lightly licking her face, or laying next to her trying to calm her. If she is playing, Harley is right next to her, trying to do whatever she is doing, even coloring! I taught my goddaughter to color with her toes and just lost it when she stuck crayons in between Harley’s toes and was trying to get her to color too! A nice feel good story to start the day off! @theprettychic Thanks Kelli, we aim to please! I agree, this story is absolutely adorable. What a beautiful dog! The part about Harley Quinn coloring is so precious!